Crumbling brickwork and loose window glass in the House of Commons pose a "potentially catastrophic," life-threatening risk to members of Parliament and others, an internal Public Works report warns. A heavy piece of glass from a stained-glass window in the chamber has already crashed to the floor, without injuring anyone, and a group of consultants says the problem must be fixed soon for the health and safety of everyone using the Commons. The report also warns that loose bricks in the roof area of the Commons foyer, just outside the chamber, could crash through a decorative glass ceiling, injuring the MPs and journalists who frequently occupy the space when Parliament is sitting. Public Works, meanwhile, says it has carried out the most pressing repairs and is closely monitoring any remaining problems to guard against any health and safety risks. The dire warnings appear in a report commissioned by Public Works last year, and obtained by CBC under the Access to Information Act. The 177-page report was prompted by a little-known incident in February 2012, when a piece of glass was unexpectedly dislodged from a stained-glass window and plummeted down to the MPs' desks and floor below. No one was injured. The accident triggered an emergency assessment, which has revealed extensive problems with the 12 stained-glass windows that were improperly installed in the Commons chamber in the early 1970s. Water damage and poorly fitted framing has since loosened the glass as well as the surrounding bricks and stonework. The problem "structurally stresses the glass, which could result in additional glass breakage or additional pieces of glass falling from the panels," the report says. Public Works has previously emphasized heritage conservation as the reason for a program to repair and restore the stained-glass windows, with no mention of the threats to health and safety from falling glass. The 12 stained-glass windows were a project for the Canadian Centennial project, representing the 10 provinces and then-two territories. Each panel contains about 2,100 pieces of glass, many of which have become wobbly over the last 40 years as frames buckle in the heat and rain. 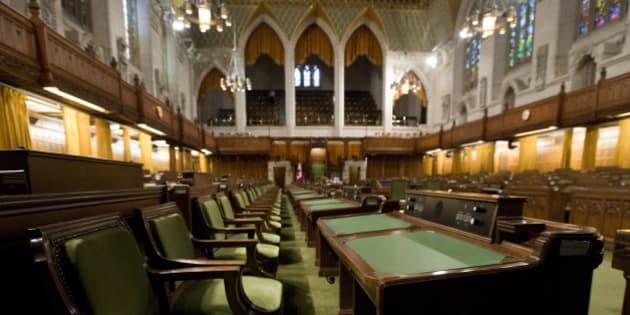 Parliament Hill's Centre Block, which houses the Commons as well as the Senate chamber, is due for a major, multimillion-dollar renovation in about four years — but the consultants warn that some repairs cannot wait that long because of "life safety risk." The firm Watson MacEwan Teramura Architects inspected all areas of the massive Centre Block, and found that the eastern half, where the Senate is located, is in relatively good shape. But the western half, which includes the Commons, has numerous structural deficiencies, possibly because of the prevailing westerly winds that drive rainwater into cracks in the masonry. The iconic Peace Tower and Library of Parliament have been recently restored and repaired, but proper repairs to the rest of the building have been put off, sometimes for decades. The stained-glass windows were installed after numerous complaints by MPs starting in the 1920s, following the rebuilding of the fire-ravaged Centre Block, about the glare of the setting sun streaming in through the tall windows in the west wall of the Commons. Canvas covers, drapes and other temporary solutions were tried and abandoned over the years. A Public Works spokeswoman says three of the most damaged stained-glass windows — representing Manitoba, Ontario and the Northwest Territories — have been removed and replaced with facsimiles, under a $652,000 contract that also included masonry repairs. Public Works "continues to monitor the original stained-glass windows to determine if additional windows need to be removed," Annie Joannette said in an email. The consultants also inspected the ceiling space above a decorative glass-panelled ceiling in the Commons foyer, and discovered a mess hidden from public view. There were buckets positioned to catch leaks from rainwater, loosened bricks that were bulging, severe water staining — and evidence of previous accidents in which masonry had already crashed down, though apparently without injury to anyone. The report notes that despite repeated warnings issued by previous consultants over the years, no work was done to remedy the problems, which has heightened the risks. The consulting architects say the ceiling, like the stained-glass windows, requires immediate attention. They proposed restoration work worth up to $5 million for the two problems, which must happen well in advance of the planned overhaul of the Centre Block in about 2018. But Joannette disputed the consultants' assessment of the foyer ceiling, saying there's no safety hazard and that as a result no work has been undertaken. The area "is inspected by [Public Works'] masonry expert on a regular basis to ensure it does not pose health and safety concerns," she said. "The glass ceiling at the base of the light well is protected by a layer of safety glass as well as a solid plywood roofing membrane, so that any material that may loosen despite regular controls is not deemed to pose a safety hazard."